Welcome to the THA Website! Trophy Hunters Alberta offers top quality trophy hunt experiences at the best value in Alberta Canada. We offer Professionally Guided Big Game Hunts for Record Book Alberta Big Game. We have the most diverse hunting terrain in all of Alberta for big game hunts. No other Outfitter is able to customize your hunt as much as THA. We are able to plan your hunt specific to the game you are after. Instead of hunting out of a single hunting area, we move the accommodation to where the animals are. This is a proven method in harvesting trophy animals. 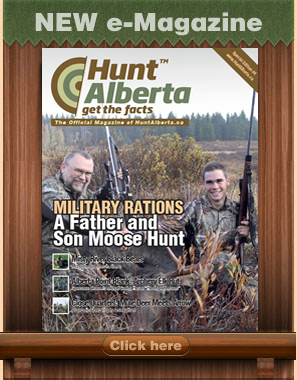 Trophy Hunters Alberta has the best track record for harvesting the largest of each big game species that we offer. We offer Mule Deer, Moose, Whitetail Deer and Elk hunts. Over the years, we have been honoured with receiving multiple APOS awards which leaves no doubt that we continue to offer big game hunts in the best hunting areas (WMUs) with the best guides in the province of Alberta. APOS Award - "Largest Mule Deer, Rifle"
APOS Award - "Largest Whitetail, Rifle"
APOS Award - "Largest Mule Deer, Archery"
APOS Award - "Largest Moose, Archery"
APOS Award - "Largest Whitetail, Archery"
APOS Award - "Largest Elk, Archery"
"Great time! 3 mile stalk, 500 yard crawl, 300 yard shot, beautiful!" "Rylan and Chad did a nice job guiding and entertaining. Chad's wife Megan prepared some fine evening meals." "Quantity and quality of game were excellent. The food was also excellent." "We had a great time. Would highly recommend Tyler and Brett Lucas. Great hunt, great people – tons of deer!" "Great trip. Beautiful country, fabulous animals, wonderful people." "The guides said "Never give up"... Look what that led to! (a successful Moose harvest)"
"That hunt rocked! Thanks for organizing this special half day hunt. I had a shot and missed with my bow and only hunted for five hours." "When David (my son) got his wolf he said "was the best day of my life". Guide was extremely helpful and knowledgeable (Father and Son wolf hunt)." "Brett is a great guide. Great trip! Covered miles of beautiful country and saw 100+ deer the first day. Took a great mule deer at sunset. Perfect hunt!" "Excellent guide. 100% knowledgeable. THA's communication was very good from start to finish." "Everything was excellent (quality and quantity of game, guide's ability and competence, food and accommodations)"
"Had a great time. Wanna come back on my 3rd hunt and try 305. Saw some bruisers."